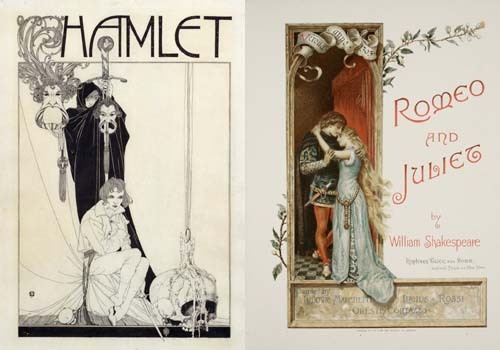 Drawing by John Austen for an edition of Hamlet (ART Box A933 no.2), 1890 painting by Ludovic Marchetti of Romeo and Juliet (ART Vol. f220). Folger Shakespeare Library. Last week, we took a reader poll to ask which Shakespeare plays were being taught this semester. Top of the list (as of this writing): Romeo and Juliet, with more than 25 percent of the vote. Macbeth took second place with 22 percent, and Hamlet third with 10 percent. Our write-in option was also quite popular, with Taming of the Shrew and Much Ado About Nothing making multiple appearances. Romeo and Juliet – In December, Folger Education recorded an hour-long master class for teaching Romeo and Juliet. You can watch the archived version online, broken down into video segments on scholarship, performance, and the classroom. Macbeth – Folger educators talk about surefire ways for successfully introducing students to the Scottish play in this podcast, Macbeth: The Teacher’s Edition. Hamlet – Watch the Insider’s Guide to Hamlet. These videos highlight the play’s themes, characters, and plot—perfect for students encountering Hamlet for the first time. Find more resources by downloading a curriculum guide for each of these popular plays. The guides include a brief synopsis, two lesson plans, famous quotes from the play, prompts for teachers, links to podcasts and videos, and a list of suggested additional resources. Want even more? Romeo and Juliet, Macbeth, and Hamlet are all included in our Shakespeare Set Free books, a series written by Folger Education’s Teaching Shakespeare Institute faculty and participants. (Today’s your last chance to apply for this year’s TSI, by the way!) Each book is packed with practical, specific ideas to use in the classroom. Could you send me some tips/advice for teaching Julius Caesar?